Makita Table Saws table saws are considered the best in their class by many thanks to their innovative features, power, and precision. Not surprisingly, This table saw is one of the top selling table saws today. Given below is a summary of their features, plus points, and minus points. 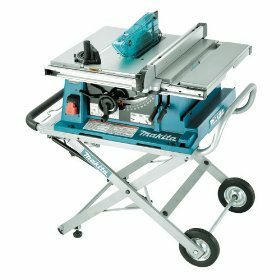 When it comes to the Makita table saw, you have two choices - you can either go for a portable benchtop table saw or a contractors table saw depending on your needs and budget. Let us take a detailed look. The 10" benchtop table saw weighs only 40 lbs and can be carried easily in one hand. 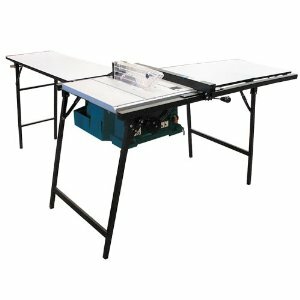 It comes with a 15 AMP motor which ensures smooth cutting, a reasonably spacious table, a rip fence which is easy to adjust, rack and pinion bevel adjustment, and an electric brake which makes adjustments between cuts both safer and quicker. For a lightweight table saw, it is quite sturdy and operates with very low vibration. It can rip 4X material in a single pass, which is quite impressive. A number of reviews have pointed out that the miter gauge is not as good as expected and it cannot be upgraded either thanks to its nonstandard size. Also, this type of table saw is not a good choice for you if you expect great accuracy in crosscuts. Some reviewers have also suggested wearing a mask while working as saw dust tends to fly everywhere. Going by the reviews, it is safe to conclude that portable Makita Saws are a good choice for people who do carpentry work which does not need any precision. You can also go for a portable contractor benchtop saw which has slightly better features and comes with a durable folding stand. These saws come with a powerful 15 AMP motor which offers 4800 RPM. Prominent features include an electric brake which increases productivity, a modular blade guard system which includes an easily adjustable riving knife, anti kickback pawls, T slot miter gauge, adjustable dual side guards, cam-locking rip fence, and an oversized on/off switch. 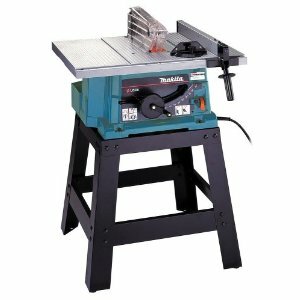 A lot of reviews have mentioned that the most important advantage of using this kind of Makita Table Saws is that they can be used for a number of purposes including remodeling, decking and flooring, cabinet installation, carpentry work, and furniture making. The saw weighs about 80 pounds and is quite compact in size. The storage capacity is quite impressive as it can hold a number of accessories including miter gauge, rip fence, power supply cord, saw blade, wrench, safety guard, and the push stick. 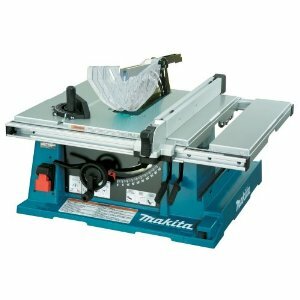 One thing that a lot of reviewers have mentioned is that Makita saws are known for their quality and reliability. So, in my opinion, if they suit your needs and budget, you can pick them without thinking twice. Return From Makita Table Saws Page to Home - Finishcarpentryhelp.com.